Japanese craftsmanship is cutting edge when it comes to kitchen knives. Chef Douglas Chang’s new Vancouver store Ai & Om Knives supplies the city with quality sharp-edged tools for the food and woodworking communities. Chang, a native Canadian, has worked in kitchens all around North America, but it was in New York where he first began to value the art of tools and hand-crafted knives, learning from a Japanese sharpening master. He spent time in Japan with knife companies and blacksmiths and developed relationships with craftsmen, who inherited their skills through generations of forefathers. The knives still retain evidence of the natural forging process used, for example, hammer marks on more rustic knives, where they have not been ground to a smooth finish, to others that retain a kurouchi or ‘blacksmiths’ finish that protects the carbon steel blades from rusting and being exposed. The interior architecture, designed by Scott & Scott Architects, functions as a clean, simple and natural space that both exhibits and stores the selected products. 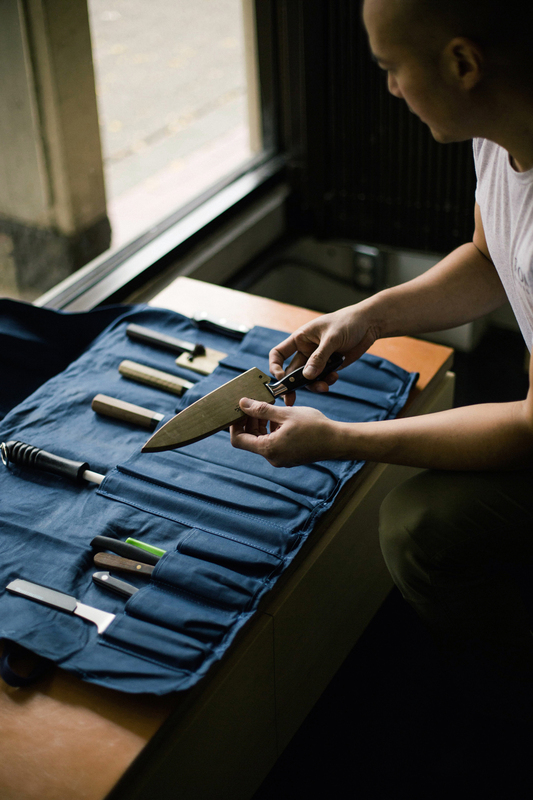 It unites both the knives’ Japanese heritage and celebrates locally sourced materials. The primary use of yellow cedar, sourced in Vancouver Island, deliberately refers to hinoki wood, a material that in Japan has a history of use in temples and shrines. It is through clean-cut architecture and a superb inventory that Ai & Om Knives claims its place as Vancouver’s Blade Runner.